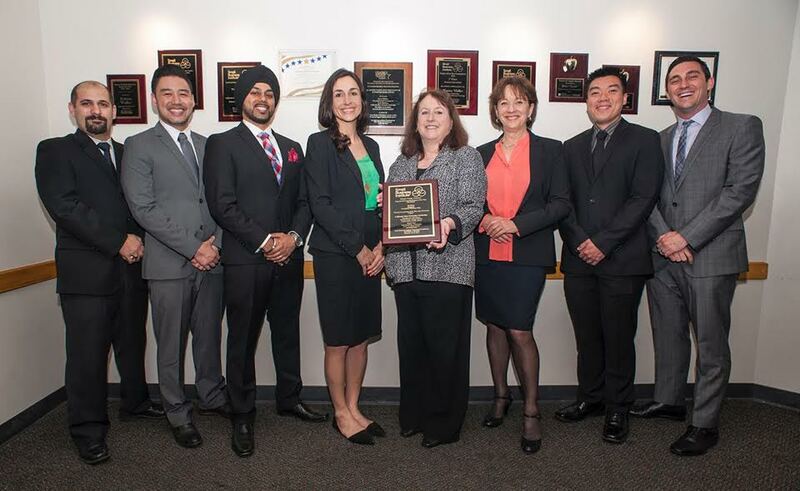 The first place MBA student team from left: Adrin Khachikian, Isaiah Liu, Anand Singh, Cristina Rubino (Team Advisor), Debra Sharon (Counseling West Executive Director), Deborah Heisley (Director of Graduate Programs in Business), Jimmy Truong and Nathan Dyce. Photo by Luis Garcia. Five students from the Master of Business Administration (MBA) program at California State University, Northridge received first place for the Small Business Institute Experiential Learning Project of the Year Award in the Graduate Feasibility/Business Plan category, for helping a small business improve its operational workflow. She said she was impressed to see the lengths these students went to working on this project and was happy to have been part of it. “The students’ effort, motivation, passion and skills were evident every step of the way. I am incredibly proud of each of them,” Rubino said. Jimmy Truong, Nathan Dyce, Isaiah Liu, Anand Singh and Adrin Khachikian worked together to analyze the most challenging business areas within an organization and provided viable solutions for their client, Counseling West, a nonprofit affordable counseling center in Sherman Oaks. The CSUN MBA program in the David Nazarian College of Business and Economics emphasizes experiential learning and is designed for working professionals, with classes offered in the evening. At the end of the program, students participate in a comprehensive culminating experience that taps into the entire breadth of their coursework. Most students satisfy this requirement with the MBA Consulting Project. Within the consulting project, students work in small teams with a client organization on a large-scale project where they produce a strategic business or marketing plan or feasibility study for the client. As a requirement of the project, the MBA team signed a nondisclosure agreement to protect sensitive information and reinforce client confidentiality. Team members were not allowed to discuss the terms of the project in detail, but provided a general overview of what they did. Dyce, vice president of the purchasing division at PennyMac Loan Services, said Counseling West was having challenges with increasing their customer base, marketing themselves and their operational workflow. In the end, the MBA team helped Counseling West move their organization toward an online business model to aid with marketing themselves. They also helped reach out to interested local schools and businesses to expand the nonprofit’s client base. Truong, a scientist who assists in the organization and performance of multiple projects such as product development, testing and analysis as well as streamlining procedures at Thermo Fisher Scientific, said the most challenging aspect of the CSUN team project was working around everyone’s schedule and participating in extra training courses on campus related to business, which they had to study over the weekend. ​The Small Business Institute (SBI) began in 1972 as a cooperative pilot venture between the United States Small Business Administration and Texas Tech University. It has become the premier professional association of small business, entrepreneurship educators and researchers, and it aims to improve entrepreneurship education through a faculty-guided, student-based field case consulting program known as Project of the Year (POY) Experimental Learning competition. In its 45-year history, more than 500 universities and colleges across the U.S. and internationally have participated in the POY competition. The purpose of the competition is to recognize outstanding student work in consulting. As a result, student participants gain valuable hands-on experience in business, gain a sense of achievement and earn respect. Winning teams receive a plaque engraved with all team members’ names.